OpenCart 2 provides an easy to use interface to backup and export tables or your entire OpenCart 2 database. 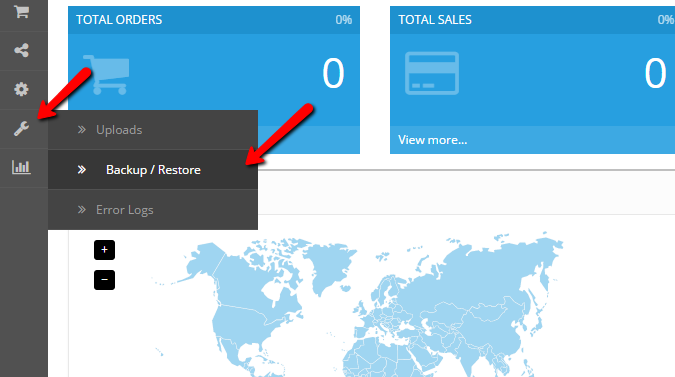 If you would like to create a backup of your OpenCart 2 database, please login your OpenCart 2 admin dashboard and navigate to the Backup/Restore section via the main navigation menu. From the ‘Backup & Restore’ click on the Select All option to mark all of your OpenCart 2 tables and use the export button at the top right corner of your screen. Be advised that exporting your OpenCart 2 database might take some time depending on the size of your database. In case you need to have only a specific table exported, click on the Unselect All option and mark only the desired table(s) you would like to download. As soon as your database is exported your browser will automatically begin the download process. You can store the database backup on your computer and use it to restore your database or tables any time via the import feature.